Comments: Created by Roy Thomas and Dan Adkins. A little history -- Fantasy Masterpieces began with issue #1 (February, 1966) and it was only a reprint book for various Golden/Silver Age pre-Marvel stories; it lasted until issue #11 (October, 1967). 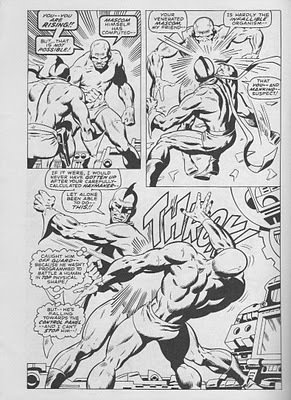 With issue #12 (December 1967), the title of the series was changed to Marvel Super-Heroes, and it continued with reprints, but also began to showcase new lead stories/features (such as Captain Marvel, Ka-Zar, Medusa, Dr. Doom). 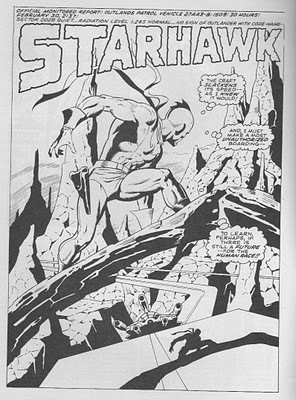 Issue #20 had an ad on the very last page for this Starhawk character, who was to be featured in the next issue. 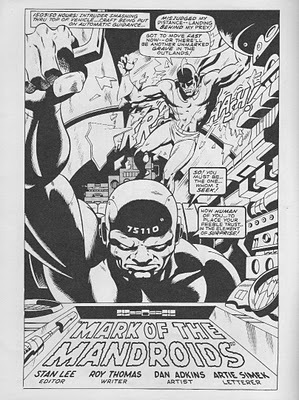 But when issue #21 came out, the series had returned to an all-reprint format (with Avengers I#3 and X-Men I#2); the series continued on with reprints of X-Men, Daredevil, Iron Man, Sub-Mariner and the Hulk, until it eventually ended with issue #105 (January, 1982). The promised Starhawk feature was never seen. 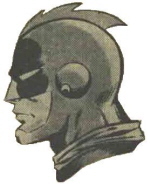 Although the character name would later be used for the more-familiar member of the Guardians of the Galaxy (who was briefly introduced in Defenders I#27 (September, 1975) but made his first full appearance in Defenders I#28 (October, 1975)), to my knowledge, this Starhawk has never actually appeared anywhere else (see below). 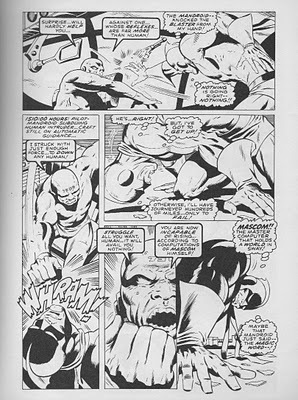 However, it should be noted that the other Starhawk's GotG teammates first appeared in Marvel Super-Heroes I#18, two issues before the ad, and there may be some connection in the concepts. An idea for a new series -- maybe they could team-up Starhawk with Cougar, Decathalon, and Lectronn, and call them -- "The Limbo Legion: The Greatest Heroes Who Never Were!" (with a special guest appearance by Humus Sapien). Prime Eternal researched the image, and has some major new intelligence! 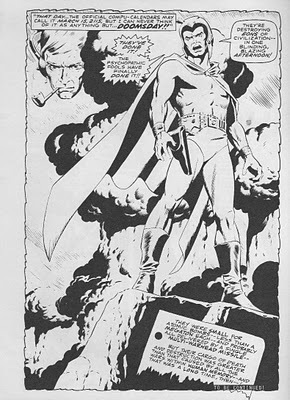 "Starhawk may or may not be familiar to you depending upon how closely you have followed his comic book career which thus far has been limited to one advertisement in the back of an issue of Marvel Super-Heroes. 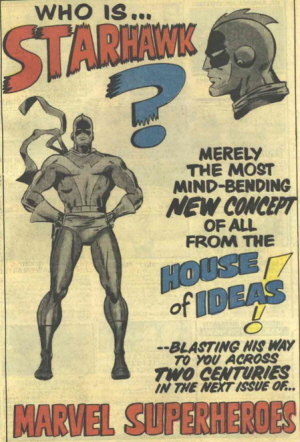 That particular ad heralded the debut of this dynamic new hero in the next issue which was, instead, reprints of old Marvels, gathered together a few minutes before press time. That Starhawk has not yet appeared is due to what may best be described as a lack of a strong format. 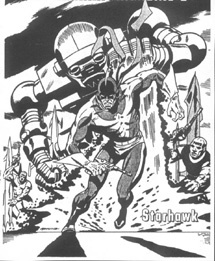 Starhawk's debut story was completed and a cover was drawn by Dan Adkins. The cover he did for the first story, in fact, is the cover of this very magazine!! However, as sometimes happens, a story doesn't work out as expected -- someone gets off on the wrong track and the end result was not what anyone intended it to be. All of Dan Adkins' beautiful pictures only served to illustrate story elements which were not to Starhawk's advantage. 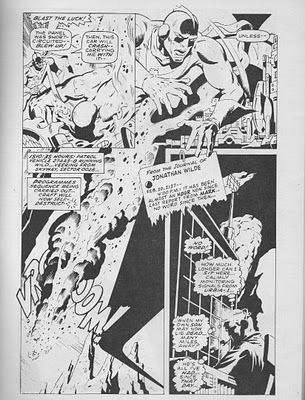 In short, it was felt that the first issue was a step in the wrong direction and, rather than let Starhawk debut on the wrong foot, the issue was yanked at the last minute and reprints were substituted. Exactly when Starhawk will make his actual debut has not yet been decided but this we can say as fact -- He will appear in the pages of Marvel in the foreseeable future and when he does, his first story will not be anything but what it was intended to be. 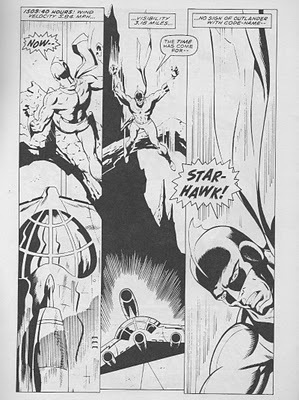 It will be written and re-written until it is exactly as desired because nothing can hurt a new character more than a false start-- From what we hear, Starhawk embodies many of the traditional elements of science-fiction in comics, as well as a number of new innovations." Outlands Patrol Vehicle 27AA3-B is traveling through a rocky wasteland in search of the "outlander" Starhawk. However, Starhawk comes to him -- he leaps inside the vehicle and faces its pilot, a "Mandroid" numbered 75110 on its forehead. They fight, and the Mandroid seems to be superior, declaring that Starhawk's defeat has already been predicted by "Mascom," the master computer that rules the Earth. Hearing this gives Starhawk the strength he needs to rise up and triumph over the Mandroid. He knocks the Mandroid into a control panel, and it explodes. Starhawk quickly evacuates the ship in a pod before it self-destructs. Meanwhile, Starhawk's father Jonathan Wilde (who mentions Starhawk's real name -- Mark) is monitoring Urbia-1 (whatever that is) while he waits to hear from his son. He begins to recall how on March 15, 2115 he saw the virtual destruction of the Earth in an atomic war. At that point, the story ends; Marvelmania might have been intending to complete the story in their next issue, but this turned out to be the fanzine's last issue! Maybe there's another fanzine out there with the rest? A big THANK YOU to Prime Eternal for providing the original scan, and to James Barlow for the additional scan.